One of the wildest and bloody racing cars is about to start. 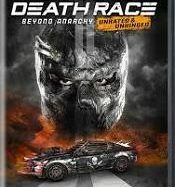 After an unsuccessful attack on a detainee and a legendary driver, Frankenstein, Connor Gibson infiltrates himself into a maximum security jail with only one purpose, to take part in the Death Race and finally eliminate Frankenstein from the landscape. Connor benefits Baltimore Bob’s and Lists’ help and suddenly falls in love with Jane, a bartender. Connor will have to fight to survive in this universe without written rules.